Highway construction work dropped sharply in June, wiping out market gains from the previous seven months amid uncertainty over the federal aid highway program and the Highway Trust Fund. The real value of highway work was $4.2 billion in June 2014, down from $4.7 billion in June 2013, when adjusted for material prices and inflation. This was the first month-to-like-month decline since November 2013 and the largest such decline in the past year. Highway construction had been showing some gains in early 2014, but the recent decline means that contractors have performed $17.8 billion in pavement work through the first half of 2014, compared to $17.4 billion in the first six months of 2013. 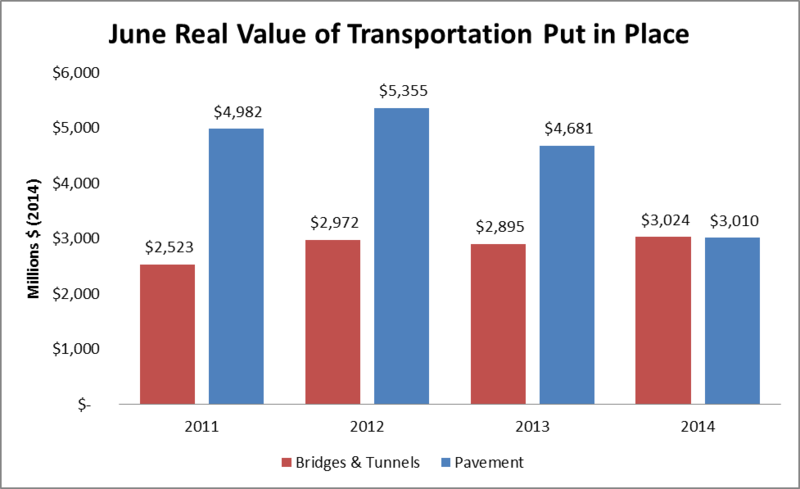 The real value of bridge construction was $3 billion in June, increasing by three percent compared to June 2013. The pace of bridge work in 2014 continues at record levels, reaching $13.4 billion in the first six months compared to $12.9 billion during the same time period in 2013. Year-to-date growth is mostly flat across all other modes. The real value of construction work on railroad projects for January to June 2014 was flat compared to January to June 2013. Airport work was down 5.8 percent, while the real value of construction work for ports and waterways was up 3.7 percent. Detailed data by month and mode is available as part of ARTBA’s market subscription reports. Source: ARTBA analysis of federal Census Bureau data for value of construction work in June 2011-2014, adjusted with the ARTBA Price Index to account for changes in material costs, wages and inflation.